SNES Super Mario World (USA) "warps" in 09:57.82 by bahamete, Kaizoman666, Mister & PangaeaPanga. 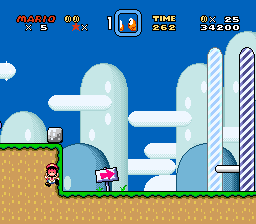 This is the 10th published movie of Super Mario World that beats the game by clearing 11 of the 96 exits, the shortest route intended by the game developers. Of all the previous movies, not one had obsoleted its predecessor by more than 15 seconds. This movie sets a new record by beating the previous movie by 22.68 seconds and clocking in under 10 minutes. Ironically, Mario dies in the process. We recommend reading the author's comments to understand how the new glitches are used in this movie. There are also movies of this game that trigger the credits early, clear all 96 exits, clear as many exits as possible as small Mario, and write a program using the game's code.